A modest piece of silver from a great maker, this small pill box is at least genuine, unlike the frame illustrated. 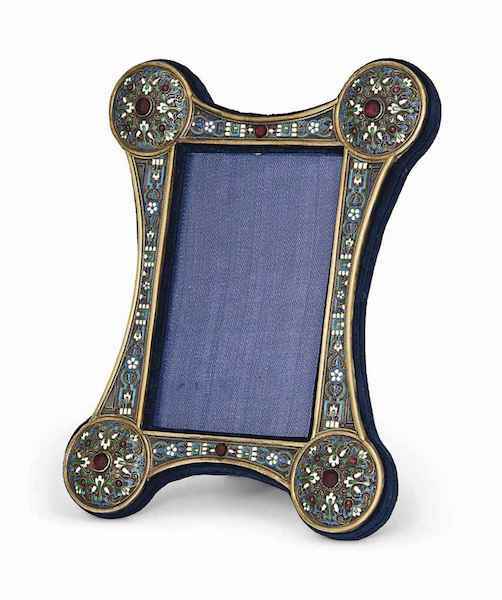 Several of my clients will have identical frames as we bought them brand new years ago and sold them guaranteed not genuine Imperial period. They now frequently turn up listed as genuine at auctions, which is fine, as auctions, unlike shops, bear no legal responsibility for their descriptions. However, the work of the great Imperial Russian Court silversmiths is in such a demand that fake pieces marked Faberge, Khlebnikov, Ovchinikov etc abound. The fakes far outnumber the genuine examples. This little lidded pill box is 41 mm wide and 18 mm tall. 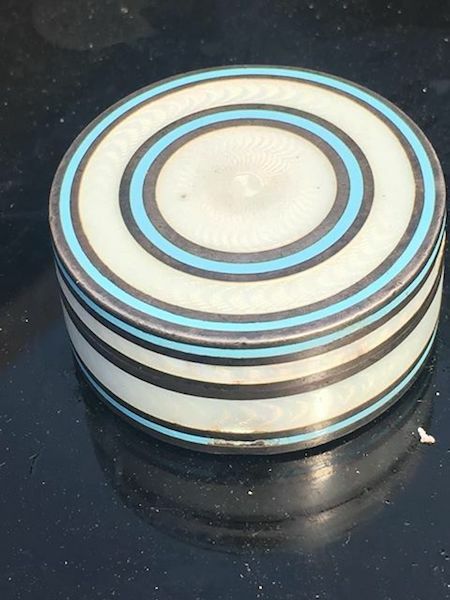 The guilloche enamel on the very top surface is undamaged, but the sides have several bingles, in both the blue and white bands. The box is marked in full on the base, with the kokoshnik mark for Moscow 1908-1917 and the silver standard for 88. 88 zolotnik silver is a fraction of 96, so it is 91.66% fine. The lid is marked with the initials mark and the silver standard 88. The double headed eagle above the name, an inheritance in a direct line from Imperial Rome, signifies that Khlebnikov was a supplier to the Court of Nicholas II.